The Mind Set - explainer video. The Mind Set is the UK’s first national peer-to-peer coaching network for GCSE and National students. It’s a bold campaign that features 12 student coaches from a variety of academic and diverse backgrounds. They have all recently taken their exams and understand the pressures involved. In a series of short clips, they offer practical and well-being advice on how to get through the stressful exam period. 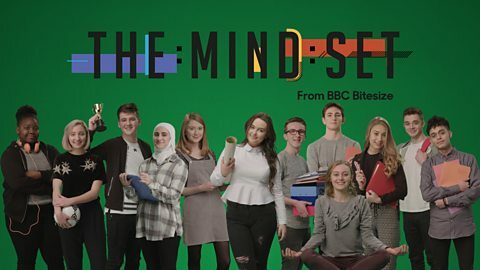 In these clips, the Mind Set team cover a range of practical advice from how to get started with revision and tips for using past papers, to physical and mental well-being advice, such as how to stay motivated and how to keep calm. The clips are also supported by interactive infographics written by experts in the field, including a GP, a psychologist, a Mindfulness expert and an educational consultant, who has been researching exam stress for the past decade. If you teach students who are embarking on their revision and want practical advice from the Mind Set team, please share our website with them, where they can access all of this invaluable content. Alternatively, you could watch the clips as part of a lesson, if you want to use them as a basis for further advice or discussion. The campaign is also working with Young Minds, Childline and National Citizen Service to offer additional support and help to students with GCSE/Nationals related mental health issues. Does the Mind Set offer subject specific advice for exams? The Mind Set offers advice around revision and exams, and does not focus on individual subjects. For subject specific revision, students can access Bitesize and the Bitesize Revision app. Will there be any more clips from The Mind Set? All of the Mind Set content is now up on the website, but we do want to support students throughout their exam experience, so there will be further content in August for 'Results Day'. Is there a cost to the Mind Set films and interactive guides? Studies show that exam stress can sometimes be the difference between grades, so this guide offers some useful tips and advice. A guide exploring the importance of staying calm during exam time with some handy tips. Keeping students motivated during the exam period can be difficult, so here's some tried and trusted ideas to help. Advice on how past papers can help students revise and prepare for their exams. A handy guide highlighting the importance of finding a revision technique that suits each students individual needs. Some great advice for dealing with exam day pressure.